Blue-collar worker Joe Smith (James Whitmore), his very pregnant wife Mary (Nancy Davis), and their son Johnny (Gary Gray) hear a mysterious voice on the radio one night, claiming to be God; soon the entire town — and the entire world — is waiting to hear what The Voice will say next. This most unusual B-picture — produced by MGM, directed by William Wellman, and starring Nancy Reagan (nee Davis) before she married Ronnie — is a rare little treat. Decidedly understated, and more concerned with inner growth than outer conflict, the story unfolds gradually and gracefully, only occasionally descending into the realm of campy humor. While we’re presented with what in many ways looks like a prototypical 1950s nuclear family — working husband, pregnant wife, and paperboy son — we’re also allowed to see the small frustrations and fears each possesses: Joe is harassed by his unfeeling boss (Art Smith); Davis is worried about the appearance of her first gray hair, as well the upcoming birth of her second child; and Johnny is horrified to see his father come home drunk one night. They may represent the all-American dream, but there are clearly issues left to be settled. In a clever twist, we never actually hear “God’s” voice on the radio: while this decision was likely influenced by a reluctance to commit sacrilege, it works well as a narrative device, helping us to focus instead on people’s reactions. 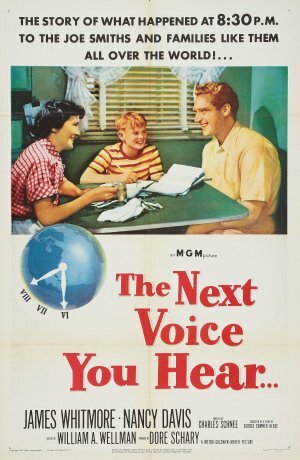 Also interesting is the fact that The Voice is heard by all people in all countries — in “churches, temples, synagogues, and mosques” — and that the name Jesus is never mentioned; this allows the film’s decidedly Christian elements (the lead characters are named Joe and Mary; Mary is pregnant) to remain refreshingly vague; one could even read The Voice as a harbinger of world unity. With that said, the film does possess some more laughable elements — including Davis’s pregnancy (she’s supposed to be days away from delivering, but only looks about 5 months pregnant, and not very realistically); some of the more cliched interactions between Joe, Mary, and Johnny; Mary’s unexplained fear of giving birth (despite the fact that she’s done so successfully before); and the overly preachy scenes towards the end. Nonetheless, I was surprised at how quickly I got caught up in this gently charming fable, which never tries to be more than it is, and certainly has its heart in the right place. Yes, for its status as an erstwhile favorite. As noted, ‘TNVYH’ does have “a decidedly unusual and thought-provoking premise” and “certainly has its heart in the right place.” I hadn’t seen this since I was a kid, and the years between have not changed its sweetness. In fact, although it’s very much a product of the ’50s, I find it timeless somehow – it’s never a bad time for God to speak up. At any rate, I’m particularly glad to have visited this one again – and will probably do so from time to time. It’s downright refreshing.